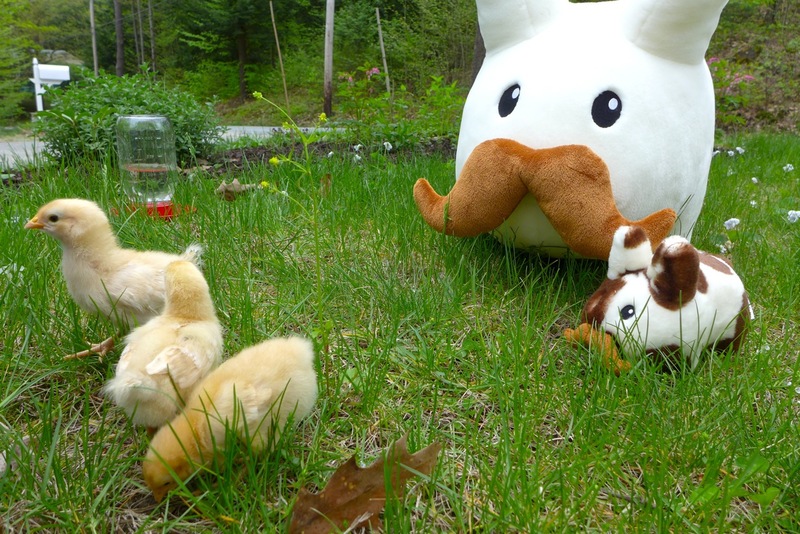 Year of the Labbit: More Mystery Guests! There was a loud knock on the door early the other morning. The house kitty went to the door but no one was there. 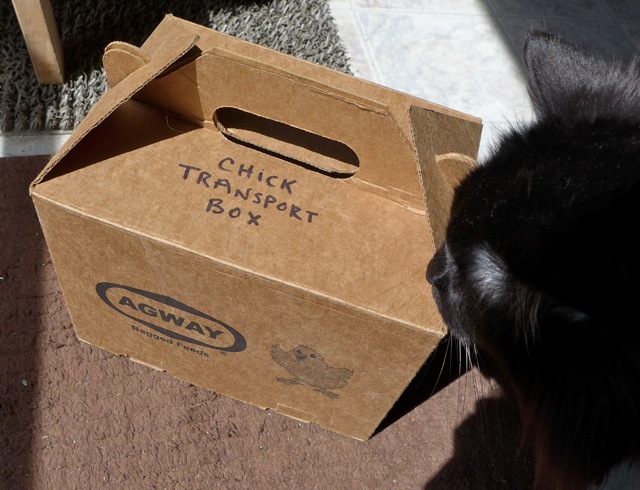 Just this box, with high-pitched peeping noises inside. ...were three little chicks! 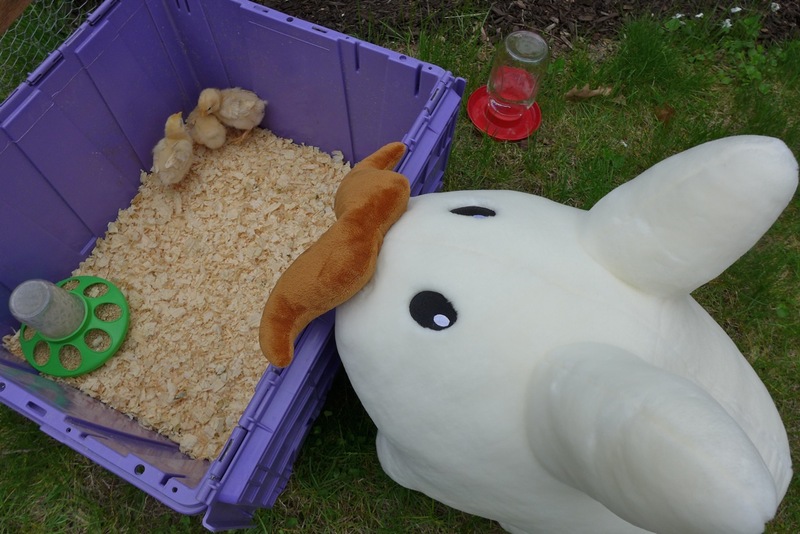 Kitty took the chicks to Chief Labbit Uncle Warren, who knew exactly what to do with them. 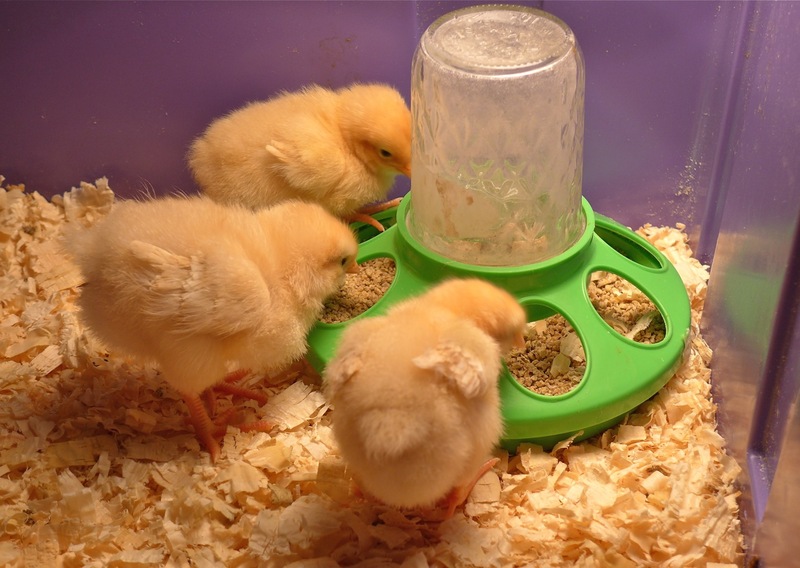 He set them up with all the things three baby chicks need to grow into strong laying hens. At the bottom of a large plastic bin which he purposed as a brooder, he laid down clean, fresh pine shavings for bedding. In one corner, he put chicken feed into a feeder, and into the other corner he would put in a waterer. 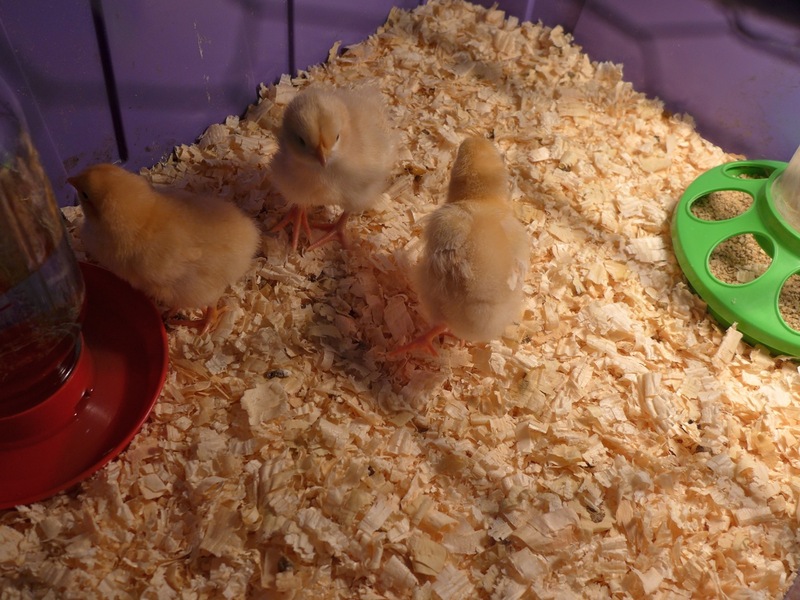 On top of the brooder, Warren placed a work light with a warming bulb so the chicks can stay warm. They need temperatures of about 90°F while they're at this young, growing stage. Warren also placed a screen of chicken wire over the brooder so the chicks couldn't fly away. 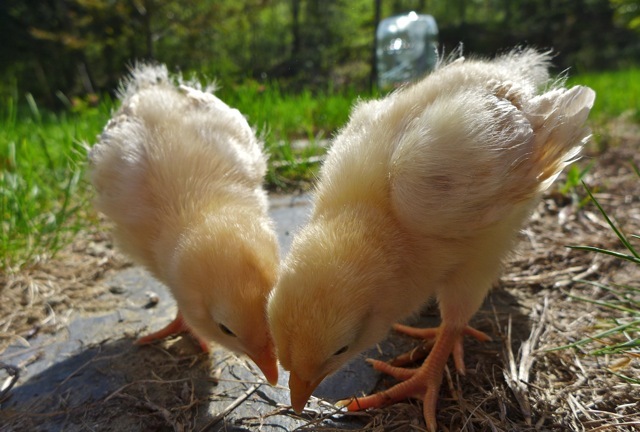 You might think of chickens as poor fliers, but at this age, their wings grow quickly and their bodies are still small, so they are quite excellent fliers. If you're not watching, they'll fly the coop! The three girls are, from top to bottom, Willow, Martha and Francine. 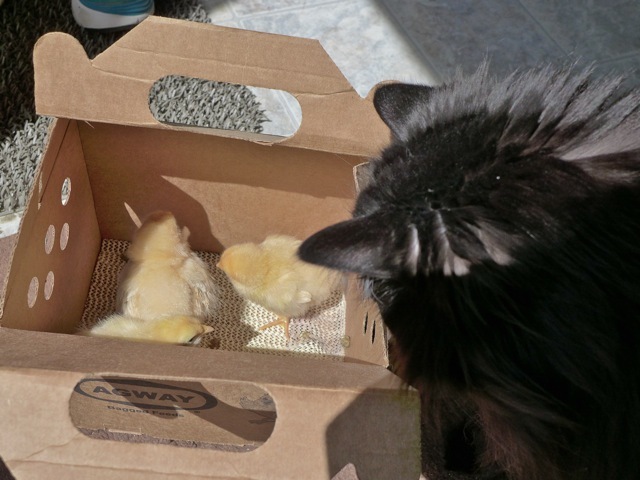 Baby chicks are easy to care for, even a cat can do it. (The warren's cat respects all animals and has no hunting urge. 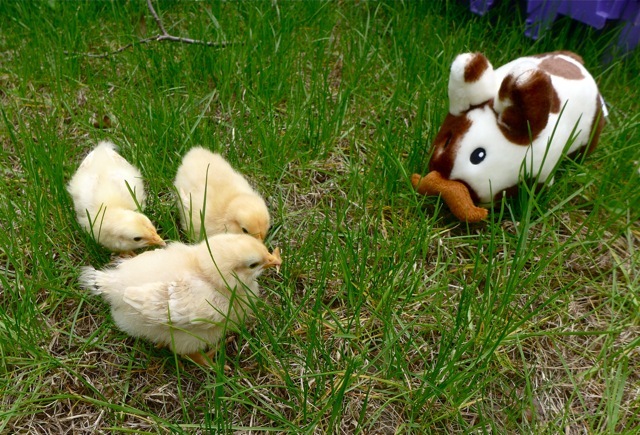 Don't worry, she never tried to attack the chicks.) 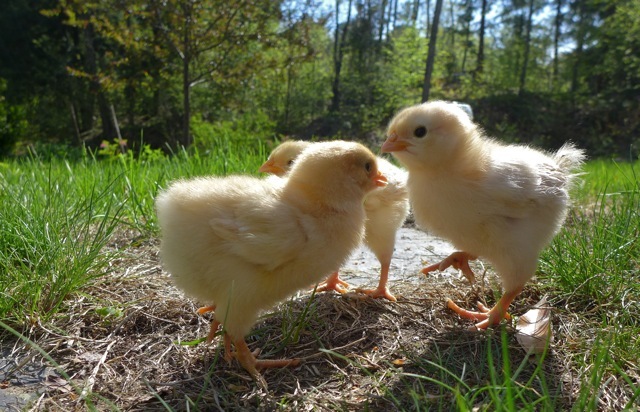 For the most part, chicks need to stay in their brooder, but on a really nice, warm day, they can go outside, as long as they are supervised. Hawks, eagles, turkey vultures, neighborhood cats and dogs - all of these are potentially dangerous to baby chicks. It's not safe to leave them unattended and defenseless, so Uncle Warren and Patrick took up guard duty to ensure their safety. Willow, Francine and Martha are quite happy at the warren and get along well. Willow's the smallest, and she's happy to be friends with everyone. She follows everyone around, but mostly she is Francine's best friend. Francine is the smartest, most adventurous and most curious of the bunch. She's the first to roost, the first to fly, and the one who leads the chicks on explorations of the lawn. Martha's the biggest of the bunch, and she's very active and asserts her size and power. She likes to kick up the bedding, run around fluffing up her wings and lead the chicks at chow time. They're a good group. 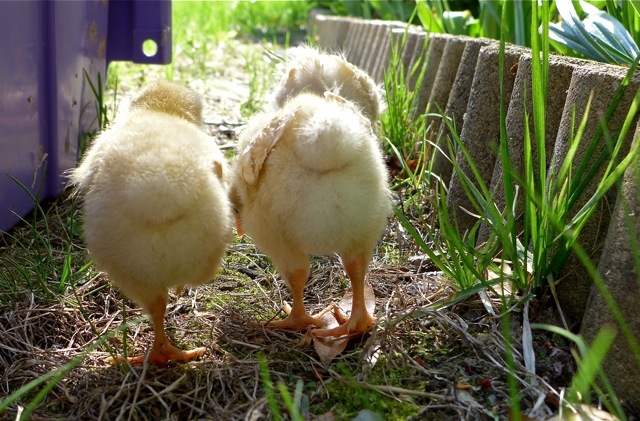 Aren't chicken butts the cutest?